In this six-session video-based small group Bible study, bestselling author Carol Kent gives proof that you can experience grace and joy during even the lowest moments of your life. This Participant’s Guide helps you decide where you stand when you are caught between a rock and a hard place: Will you place yourself in a posture of humility and complete dependence on God, or will you just “try harder” and stumble over what could be a transforming encounter with grace? Carol Kent and her husband, Gene, are living what some would call a heartbreaking life—their son, Jason, a young man who initially had so much promise, is now living out a life sentence for murder in a maximum security prison. All their appeals have been exhausted. But despite their hopeless situation, the Kent’s live a life full of grace. 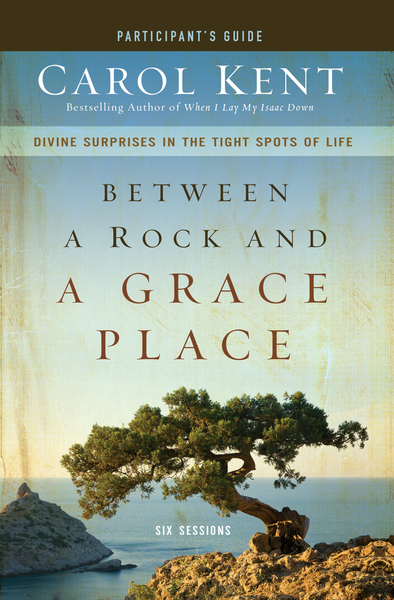 With hope, joy, and a sense of humor, Carol helps you find God’s “grace places” in the midst of your worst moments. This Participant Guide provides individual and group activities, additional background material, and between-session personal studies that will enhance your experience of the video sessions. Designed for use with the Between a Rock and a Grace Place Video Study (sold separately).